The airwaves were full of 9/11 tribute ads over the weekends, and critics were quick to label them mawkish, exploitative, crassly commercial and syrupy, just to name a few. But guess what? Somebody liked them. Lots of somebodies, in fact. A survey by Ace Metrix, which measures ad effectiveness, finds that the ads were very well received by the consumers they were aimed at. "American consumers, by and large, rated the ads very favorably," the company said after polling 500 adults. Anheuser-Busch's Clydesdale tribute spot for Budweiser, beat out the others in the genre, with State Farm's "Thanks" ad second, and a series of Chevy ads that aired during Discovery Channel's "Rising: Rebuilding Ground Zero" coming in third. Ace Metrix found it significant that the tribue ads did better than the usual product ads in terms of effectiveness. The Bud spot -- admittedly a thing of beauty -- scored a 655 on the Ace Metrix effectiveness scale of 0 to 950, Advertising Age reported, far ahead of the average beed-ad score of 478. A ConsumerAffairs.com analysis of about 280,000 consumer comments on Facebook, Twitter and other social media and blogs supported Ace Metrix's findings, showing a clear upswing in positive comments in recent days. Nearly 3,000 consumers posted comments our computerized sentiment analysis classified as positive about Bud so far this month, compared with about 1,700 one year ago. 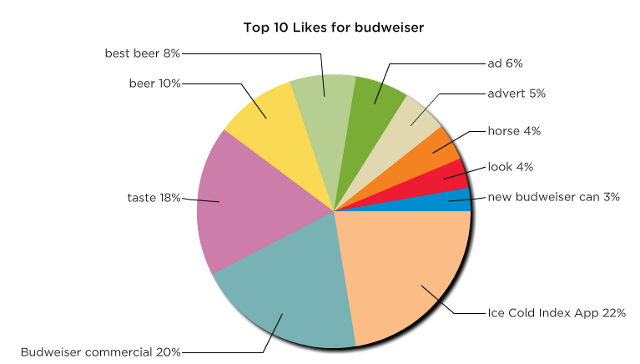 Among the most frequently used words and phrases used to describe Budweiser were: "Budweiser commercial," "advert," "horse" and "best commercial."